The first thing the kids noticed was the glass. Walking through the halls of Newhouse 3 in the first year of their participation in the “Smart Kids, Visual Stories” project, students from Syracuse city school Levy K-8 couldn’t fathom how the university felt so comfortable allowing so much exposed glass. In their school, the glass windows were covered with bars. “What they noticed was really significant [regarding] the assumptions made about them in urban schools,” says Sari Biklen, Laura J. and L. Douglas Meredith Professor of Cultural Foundations in Education at the School of Education. After receiving a Chancellor’s Leadership Grant, Biklen and Michael Schoonmaker, chair of Newhouse’s television-radio-film department, spent the past three years working with over 20 fourth, fifth and sixth grade students from Levy K-8 on “Smart Kids, Visual Stories,” an unprecedented multimedia alternative listening project. It was initially meant to be a joint research project exploring what Biklen calls the “deficit discourse,” or the idea that kids can be only viewed through the lens of the problem rather than the solution. But, the project soon took on a new life as the students crafted heartfelt videos expressing their deep desire to simply be heard. “It was kids’ voices, real and beautiful. It was a new kind of a genre,” Schoonmaker says. Biklen and Schoonmaker gave the 21 students lessons in shooting and editing video and visual communication, and asked them to create short films highlighting their personal opinions on how they are treated in school. They hope eventually to present their work in one cohesive film to the Syracuse City School District as a means of inciting direct change from the students themselves. The desire to have their voices heard increased tenfold when the students learned midway through the project that the Syracuse school board had decided to close Levy K-8 as part of budget cuts, and the kids would be redistricted to four different schools, effective immediately. One of the films, “Being New,” tells the story of student Anika Trinhaus’s abrupt move from the school she had known and loved to a new, strange school. Biklen says the film moved Trinhaus’s mother to tears when she saw it. Last June, Newhouse hosted a special event for the premiere of the students’ videos. 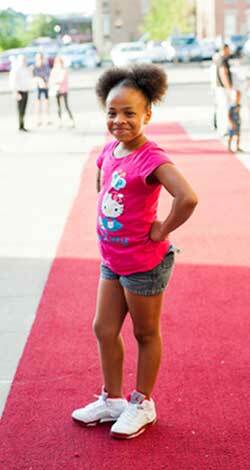 Students and their families arrived at the school in limousines and walked the red carpet. The event was held in Newhouse 3’s Joyce Hergenhan Auditorium, which was filled to capacity. Inspired by the project, Schoonmaker and Biklen say they have both received requests from their former students for access to video equipment so they can continue pursuing film. Some have even expressed an early interest in attending Newhouse, an unexpected reward from the project. “We started out trying to help schools, but every time we went there I felt like they were helping us. We would come back with a kick in our steps; it was really inspiring,” says Schoonmaker. This story was written by Dee Lockett, a graduate student in the Newhouse School.